Here at Nature's Comeback we only keep animals that can thrive in conditions that are as close as possible to the way they have lived for thousands of years. We call it "survival of the fittest". Our animals must continue to gain as well as reproduce on the grass available in the Spring through Fall. They must also be able to retain weight throughout the winter on mixed grass hay. For this reason we cull hard and deep. We have cows that have been here on the ranch for 13 years and also have their daughters and grandaughters. These bison must also able to produce calves for us on a yearly basis. We purchase top quality bulls that have the conformation, desired temperment and high end weight gain that we expect. We are proud of the advancements that we have made over the past 23 years and know that our efforts not only increase the quality of bison, but make a difference in our bottom line as well as yours. 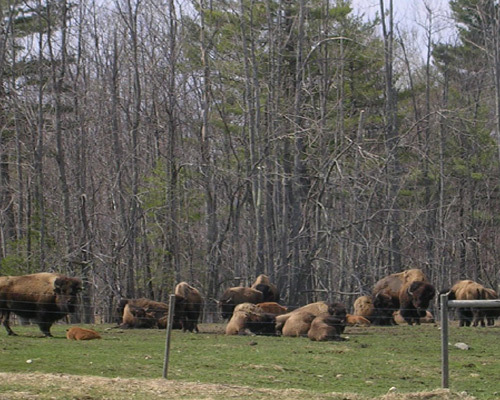 The herd enjoying new Spring grass after a long hard winter.